DONETSK, Ukraine -- International monitoring of the Russia-Ukraine border is "grossly inadequate", the US says, urging a bigger mandate for the OSCE security organization. 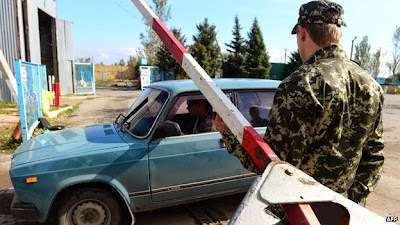 The border at Uspenka is under rebel control, like many other Ukrainian border crossings. The complaint came from the US Ambassador to the OSCE, Daniel Baer. Nearly 300km (186 miles) of the border is beyond Ukraine's control, he said. Russia, as always, denies Western allegations that it is sending troops and armour into Ukraine to help pro-Russian rebels. Fighting in and around Donetsk has left a 5 September truce looking fragile. Since 26 September the Organization for Security and Co-operation in Europe (OSCE) has been monitoring the ceasefire. The combatants were supposed to establish buffer zones, but in many places that has not happened. Several big convoys of Russian lorries have taken supplies to rebel-held areas without any border checks. Russia says they only carried humanitarian aid, but neither Ukraine nor Western observers are sure of that. The OSCE's chief observer, Paul Picard, said his team was discussing the possibility of going to other border checkpoints in areas no longer controlled by Ukraine. "The current [OSCE] observation mission has access to about 1km of the international border," Daniel Baer complained. The mandate of the OSCE mission on the border must be expanded, he said. Currently it only has access to checkpoints at Gukovo and Donetsk on the Russian side of the border. Since April the heavily armed separatists have been controlling the eastern Ukrainian cities of Donetsk and Luhansk, as well as much of the border. "We call on Russia to engage immediately with Ukraine and the OSCE to implement monitoring and verification of the international border as agreed in Minsk, to include restoring Ukrainian control over its side of the border, and a heavy weapons-free buffer zone on either side of the border," Mr Baer said. He also urged Russia to fulfil its other Minsk commitments, namely to use its influence with the separatists to end truce violations, withdraw all military personnel and equipment from Ukraine and release all hostages. A senior adviser to President Vladimir Putin said the Russian leader may meet his Ukrainian counterpart Petro Poroshenko at an Asia-Europe (ASEM) summit in Milan next week. The meeting, on 16 or 17 October, could include German Chancellor Angela Merkel and French President Francois Hollande, according to the aide, Yuri Ushakov. The last Poroshenko-Putin meeting was in the Belarusian capital Minsk in August, where they agreed on the ceasefire conditions.